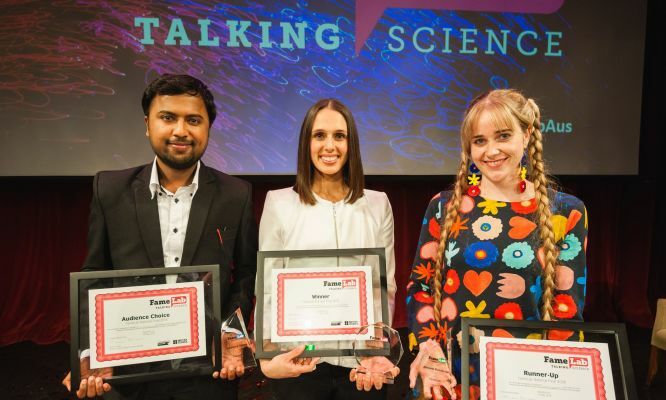 Join us at the State Theatre Centre of Western Australia, Heath Ledger Theatre on Wednesday 8 May 2019 to see semi-finalists from Queensland, Victoria, New South Wales and Western Australia tell their amazing science stories live and free, as national finalists. You’ll see some of the country’s brightest minds tell their science stories in just three minutes or less with no props, no jargon, and no PowerPoint. On the night, 12 brilliant researchers take to the stage to deliver short and sharp tales of their work explaining why their work matters to the world in order to become the next FameLab National Champion.